Q: Can you build earthbag domes in a wet and rainy climate? A: I do have some reservations about building earthen domes in rainy climates. In Mexico we plastered the outside of a dome with a cement/lime plaster that had an admixture of latex to help make it more waterproof. We also painted the dome with the standard roof paint available in Mexico. The potential problem with this is that if the paint isn't maintained, or the plaster cracks over time, then moisture can work its way into the bags underneath and not be able to evaporate readily. This could lead to saturated bags of mud, which are completely unstable and the whole structure could be compromised and even collapse. For this reason Owen Geiger and I no longer recommend earthen domes in any climate other than rather arid ones. Q: Is there a suggested height of an earth bag dome in relation to radius? A: It seems that often the height of an earthbag dome ends up being about the same as its diameter. This is because most earthbag domes are not true spheres, but more elongated height-wise. Q: According to the size of the structure, how do you know how much to reduce the size of each row of bags as you proceed up in order to come together at the top to form a dome? A: Well, there are various shapes that you can attempt to build, and the shape that you want determines how you place the bags. A hemispherical shape is difficult to create because the higher you go up, the more the bags must come in, and it may eventually become unstable, unless there is a framework built up to support it. The domes that I have made are generally measured with a piece of string or rope, or a rigid piece of pipe. I would first lay out the circular perimeter the way I wanted it, then use the rope or pipe to measure for the placement of the subsequent layers. I basically created an arc, with the fixed length describing it from the perimeter at the base, through the center of the circle to the opposite side of the wall, and rising upward to about the height of one story. At this point I set up a simple tripod of poles to use as a guide for placing the rest of the bags. In other words, the top of the dome is actually a cone, going up at an angle that would allow head space in the loft area, and not come in too abruptly for the bags to need support. I would suggest not coming in any more than a cone that would be described by an equilateral triangle, if that makes sense. Q: Has anyone come up with a height /diameter ratio that makes bag building unstable as far as the cone slope is concerned? 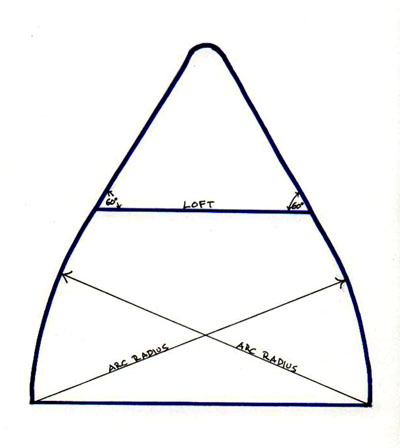 I plan a circular structure 20 feet diameter (outside measurement) with a 13 feet height to the apex. A: Not that I know of. Our pantry has a slope of about 45 degrees, which I think would not be stable without the pole framework to help support it. A safer angle would be about 60 degrees, which would make your height about 20 feet. This would be a 1:1 ratio of diameter to height. I would say it partly depends on what shape you want the dome to take. Also, if you want a roomy feeling at floor level, you don't want the walls to come in very sharply. Q: I'm still not sure how to increase the corbel size radically at the top of the dome. As is, we increased the corbel each row, usually 2" and sometimes as much as 3". It's a little tricky going beyond that, but others have done it so I know it's possible. A: You can corbel the bags quite a bit more than 2 or 3 inches, especially when you get that high and the radius is getting small. It is a little surprising, but the tight circles actually don't want to fall in as much as the larger ones. Q: Also, Kelly, in your experience, what would be the biggest diameter you would build without an elaborate support structure? A: Our bedroom dome is 16 ft. interior diameter and is totally self-supporting. I might try one that is say, 20 ft. It helps having a loft at about the 8 ft. level to tie the structure together at that point and make it more rigid. This also provides more usable space and gives a platform for working at the higher levels. A: The bedroom that we happily occupied was 16' diameter, which allowed space for a curved earthbag staircase up to a small loft. A 14' diameter room would allow space for a smaller ladder to access a loft. Anything much smaller than this will not have much loft space. The difference in size should not affect the thermal attributes much. Q: What is the largest dome structure we can build and use just scoria in poly rice bags (as opposed to cob and scoria in poly tubes)? We would like to build it about 18-20 feet in diameter but we're worried about structural integrity. But we will be building a loft, too. Does that add greatly to the structural stability? Then we would have to build it as high as it is in diameter at the base, right? So 18' x 18'? A: The largest earthbag dome that I know of is one that I build, which is an elliptical one, roughly 20'X30' on the inside. I don't recommend trying ellipses after this experience, since I had to rebuild it once with a rigid pole framework on the inside to help support the shape. With a perfectly circular dome, you should be able to go up to a 20' diameter (interior) without too much concern. I built my dome with rice bags filled with the scoria. Yes, a loft within the dome does help support and rigidify the structure considerably. Depending on your design, it will likely be at least as high as it is wide at the base. Q: I'm looking at building a multi-dome home within the next few years. How much weight can a larger (20-24 foot diameter) support? The reason being I live in the Upper Peninsula of Michigan and we get quite a bit of snow in the winter. A: You don't say what the dome would be made of. This can make a big difference. Monolithic concrete domes can withstand enormous pressures; geodesics do pretty well, depending on what materials go into their construction; earthbags are perhaps less certain about their strength in this regard. My earthbag/papercrete dome withstood quite a bit of snow in Colorado, but I built it with a rigid pole framework on the inside. Q: The dome may be easier, but as I would be trying to avoid shear stresses to maximize span, the coil of soil has to be shaped uniquely with each lift. Something has to be in place to carry the horizontal loads until the dome is complete, and there almost has to be an 'eye', which would be a rigid frame that can carry all of the compressive loads. All of this becomes very complex. I like the simplicity of a corbeled dome, but it can not be nearly as strong (thus, wide) as a property designed and built catenary (or nearly) version. The math says I can get a 20' radius, 13' high in the center, and still carry the hoop stresses around the perimeter with a 1" steel cable. From your experience, how would it be best to construct a catenary dome? A: The trick with building a stable earthbag dome is to keep it perfectly symmetrical (circular) and use the two strands of barbed wire between each course. It is the wire that constrains the horizontal forces. The bags of soil can handle all of the vertical compressive loads just fine. The other trick is to not corbel the bags at a rate beyond about a 30 degree angle, making the dome somewhat more conical than hemispherical. This can change for the last few courses at the very top if you want. C: I think catenary allows a much larger dome. The corbeled dome requires fairly thick walls, and relies on the shear strength transferred by the barbwire. You are missing a great deal of the available strength that is within the bag itself. On paper, a catenary dome 12m radius, 8m high has an maximum internal stress of 336 kPa, (assuming self weight=24 kN/m3, applied distributed vertical load of 6 kN/m2) Using the test results from Colin McDonald at Queens University, one can get 750 kPa from rejected feed bags partially filled with soil. With stronger bags, uniform filling techniques, and the best aspect ratio of each bag, much higher loads are achievable. Thus, the size of the dome can be huge. The minimum thickness of the wall is estimated by comparing the difference between the catenary and the parabola of that size. The parabola is the right shape when self weight is much less than the vertically applied loads, and the catenary is the right shape when the self weight is much greater than the vertically applied loads. The line of force always acts between these two shapes, regardless of the loads applied. The line of force must always pass within the middle third of the wall. Thus, the difference between these two curves must be less than 1/3 of thickness of the wall. To be safe, we can assume the building is built 'self-loaded only', and the catenary governs, and the line of force acts through the middle of the wall. Only half of the middle third is then available. Thus, the wall should be at least 6x the difference between the two curves, without any further analysis. I get the dome thickness should be at least 8.2% of radius. A more detailed analysis may be able to reduce this substantially, as the applied loads may be significantly less than the self weight. I was thinking I could use plywood forms during construction. As the height is 4m, I need poles 4m long. When the forms are placed near the bottom of the dome, the poles need to be anchored 2m from the center - use steel rings set at specific radii. Each 4'x8' wide sheet would be anchored against 2 rings, with some overlap in the top corners. 15 sheets would do the first meter of height, all the way around. 12 more would be needed for the next meter, and would sit on the lower tier. A total of 5 tiers would bring it up to less than 5' from the center. One the 2nd tier is complete, the first tier would be removed. It will shift slightly, as the bag's shape change with the change in loading, but I'm pretty sure it won't go far. A: I hope that you document all of this well when you get around to building this. I would love to feature it at this site! I am not trained as an engineer, but what you say sounds reasonable to me. C: Beware of any unreinforced construction method, especially in earthquake country. You will recall from news stories about earthquakes in many Asian countries that they have high death tolls. This is often because in many impoverished countries metal reinforcement ("re-bar") is omitted, to reduce construction costs. In an earthquake, such buildings just collapse. Sandbag construction and Earthships must be reinforced. This is best accomplished by placing re-bar vertically on two-foot (or narrower) centers through the wall stacks, making sure that the top of each piece of re-bar passes through a wood top sill, or that it is at least firmly wired in place. 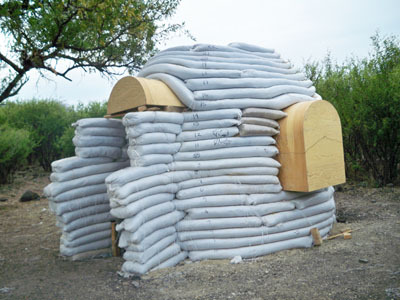 Earthbag building is exceptionally strong and ideal for survival shelters. Tests have shown all that is typically needed is two strands of 4-point barbed wire between courses. Reinforced plaster (plaster with stucco mesh) on both sides and a reinforced concrete bond beam add further strength and is all most people need. In earthquake regions, Gripple tensioners (a tie-down system) or the equivalent is recommended. 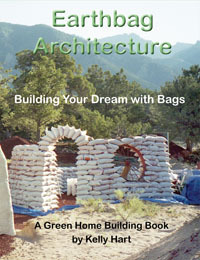 Also note, earthbag building is much faster and easier than building with tires and rammed earth ('Earthships'). Not convinced? Time yourself ramming earth into one tire and compare it to filling and tamping the equivalent length of earthbags. Multiply this times the number of bags or tires needed in your design. Q: If one were to use a removable form system, would it work to construct a semispherical dome by tamping each course of bags at the appropriate angle in the way one does when building an arch? A: This approach might work to form an earthbag hemisphere, but I would never feel totally secure living in it without some sort of rigid interior framework. I did once design and build such a framework for a small earthbag dome that was created with a wooden geodesic framework that was actually quite handsome when finished. I think if you didn't want a framework, then an catenary arch would be inherently stronger and more durable. Q: I'm building my dome shelter by following your instructions in "Building Riceland." Its up to a little over 3 feet in height. I deviated from design by installing another dummy door for later expansion to another dome. How do I interface another dome at the dummy door opening? A: As for interfacing the domes later, there are several ways, depending on how you want the space to be arranged. One is with a small vault between the two domes, and another would be to actually overlap the domes slightly, so that the second one rests partially on the first. Q: Here is a sketch of the home / restaurant I want to build in my wife's country of Kyrgyzstan. Any Comments? A: Your design concept is certainly fanciful and quite lovely, really. Could be built with earthbags? Not easily. Domes that are more of a catenary arch form are more easily accommodated with earthbags; these spherical shapes, or convex shapes would likely require some internal rigid framework to help support them. This is possible, but it definitely adds to the complexity of the project. Q: I intended to make a 19' dome. Your FAQ says 20' is about the max. But I realized after everything was finished that the outside DIA is 22'. A: I came up with that 20' max suggestion just as a conservative figure that I knew would be fine, based on my experience building the large dome in Colorado. It was ellipse that measured 20' X 30' on the inside...so my thinking was actually inside dimensions. And it was off the top of my head. Your 19' dome is well within this rough suggestion. Q: I love the concept of dome homes but am interested in a larger diameter than the limited 20 foot model. I'd like your input on the possibility of building the cylindrical floorplans you have with say about 32 foot diameter (two bedroom round house), but instead of putting a traditional roof on it, buying one of those prefabricated 32 foot fiberglass domes that are out there. Examples of what I mean can be found at domesintl.com. The question is, do you think this very light structure could be tied down to the earthbag walls with some sense of security that it won't blow off? My hope is that I can build a first floor sunken into the earth (basement) and a second floor at regular earth level, and put the dome on top. This way I don't have to build supports to hold up the dome and I'm still free to design the interior however I like. A: Yes, I think what you propose is entirely feasible. Obviously the floor between the two stories would need to designed in such a way to be well supported, but that shouldn't be too hard. There are various ways to attach such a dome to the earthbag wall that should be sufficiently secure; a dome doesn't offer much resistance in a wind anyway. Q: Do dome walls need to begin "stepping in" immediately from the ground level, or could they be vertical to a given height and then begin the corbelling? If the latter, would you need buttressing on the outside to keep the lower walls from bowing out from the pressure of the corbelling above them, or would the curve of the wall be strong enough in and of itself? A: I think that it is quite safe to raise a circular wall vertically before corbelling in for the dome, without the need for buttressing (except for doorways). This is predicated on the use of two strands of barbed wire running between all of the courses of bags. The wire creates mini tension rings (or bond beams), similar to a yurt structure, which resist outward expansion. By the time you get to the last row of bags on the dome the forces become vertical, which the lower bags can easily handle. Q: Any way to give it a more circular arch instead pointed? A: I did once design a completely hemispherical roof for someone and this was accomplished by first building a geodesic wood-framed structure that was left permanently in place and supported the bags toward the top. Q: We're on the Sunshine Coast of BC (Canada), where we have lovely autumns and warm but rainy winters. So my question is: Is there any reason not to build with earthbags in the winter up here? We're considering a small dome (14' inside diameter) with loft and attached post-and-beam porch. We are also debating whether to go with a dome/cone-on-loft shape, or just cylindrical walls with loft and a stick-framed/cedar shake roof to shed all that wet-coast rain. A: My sense is that a cylindrical building with a more traditional roof would suit your climate better than domes. The issue with domes is always how to keep the moisture out over the years, and this is easier done with a roof with eaves. Q: I am designing an earthbag dome building. The diameter is 11.5'. The walls are vertical to 6' then dome in at a 65% angle. Dome height is about 13.5'. Does this sound feasible? This way I can put in a 6' door. A: Yes, I think what you describe is feasible, and the structure should be stable as long as you pay attention to certain details: Use two strands of 4-point barbed wire between all courses of bags. Provide either buttresses or strong vertical column supports that are integrally tied to the bag walls on both sides of your doorway. Create a circular bond beam just above the door that will act both as a lintel over the door and provide a tension ring and base for the cone that will be formed above it. Fill the bags with material that compacts well into a solid block that resist shifting over time. Q: Here is a picture of my dome, which appears squashed and I have a fear that it might fall. The arches were made with earth and lime. Let me know if it is dangerous. A: It is hard for me to say whether it might fall or not. The top of the dome above the door and window angles in more than I usually recommend. It looks like about a 45 degree angle, and I usually don't go past about 60 degrees. The other thing is that with the small size of bag material, there is not as much of the bag underneath for it to rest on, so it will tend to want to fall inwards. The fact that it has not fallen is a good sign. Once you get it plastered, this should help hold the shape, especially if you use some mesh reinforcement. Q: My husband and I plan to build a 30ft dome (with loft) that we then have 4 20ft domes connected to (vaulted hallway connections). I read that you suggest 20ft max domes. I also read where you explained that it has a lot to do with design. So, how would you suggest 'reinforcing' such a structure in the main dome. A: One thing that you might consider is to construct an interior framework to help support the bagged dome. Something similar to what I did with the elliptical dome that I made or possibly a geodesic framework. This would help solidify the shape and give you some assurance that nothing will change over time. Another suggestion is to use only light-weight fill material in the upper portions of the dome. Q: I know that with an earthbag dome you're limited to about 20 ft max, and it can't be a hemispherical dome, but if one were to build a geodesic superstructure out of steel pipe of 1.5-2 in dia, and were to use chicken wire or rebar or some other method of filling in the gaps of the frame to produce a hemispherical dome of much greater sizes of upwards of 40 or even 50 ft, and using the earthbags and superadobe method to skin the frame, is this possible? A: Yes indeed, this can be done; I have even done it myself with a wood-framed geodesic supporting a hemispherical earthbag dome of about 20 feet diameter, and it worked out great. We left the wooden frame exposed on the inside. Q: I am building a superadobe dome here in Brazil. It is one dome only building with internal diameter about 24.6 ft wide. The estimated height we´ll be achieving soon for the closure of the dome is about 23 ft. The earth material is a mixture of clay, cement and sand to avoid infiltration because of the high rainfall here. We are using movable scaffolding inside the dome to distribute material along the rows, but it is still not working well. I am not sure how to guarantee the safety of the people working during the closure. Another concern of mine is about the structural integrity of a dome this wide, does it need temporary or permanent. anchoring or reinforcement of any kind? A: One factor in determining the stability of the building is how much the wall moves or vibrates when being walked on. If it is shaking very much, then I would be more concerned than if it felt rock solid. All of the larger domes that I have made have stabilizing supports or vigas going across at loft level, and this has rigidified the structure considerably. You might want to add something like this for this reason alone, if you feel unsure about the stability. These vigas can also provide a nice platform for further work above to finish the dome. Q: I was wondering if there is a limit to the size of diameter an earthbag dome can have. I am wanting to have a dome with more than 800 sq ft. I would like it to be a dome because I do not want the hassle of constructing a roof, and I'm a simple person so I am only wanting to construct one dome instead of multiple ones. A: We usually advise people that about 20 feet in diameter is as large as can safely be constructed. In order to get 800 sf in a single dome it would have to be about 32 feet in diameter, and this would be considered risky. However, large domes can have lofts to increase the floor space, so that is worth considering. Q: I am in the planning stages of my first earthbag project. I am thinking about building a small 8 foot interior diameter dome. I am considering building it up against and existing building on the farm that has a cement wall. The weird thing about this project is that it will be a half dome. So instead of a circle floor plan it would be a half circle. I have not found anything like this before and not sure if it would even work. A: I did something very similar to this, although somewhat bigger, as a pantry addition to a larger domed earthbag house. There are a couple of photos of it at greenhomebuilding.com . I used the pole framework, with the poles leaning against the larger structure, because the angle of the top was too shallow for just stacked bags. All of this worked out just fine. With a smaller dome like you are planning you may not need the extra supporting poles. Q: How hard would it be to build a true dome, where the earthbags are angled inward and compress each other, rather than a corbelled dome? Would that do a better job of distributing the compressive forces down through the dome as a whole? A: Not really... once the corbelled dome structure is in place the compressive forces work exactly the same as with a dome fashioned as you describe. I’ve seen at least one resource that says underground corbelled domes do achieve compression from inward pressure of the surrounding earth, I guess a kind of lateral arching. It is true that the force of the earth does tend to compress the dome even more. Is it just a matter of the technical difficulty of supporting the dome until the “keystone” is in place, i.e., corbelled domes are just a whole lot easier to construct? They are considerably easier to construct. Would the lateral compression of each level be self-supporting, such that you’d only have to provide support for one ring at a time? The corbelling is never cantilevered enough to require additional support. Or would it be a matter of building a whole frame to support it during construction like for window/entryway arches? This would probably be necessary if you wanted to try what you call a "true dome". But bear in mind that hemispherical domes would still be more vulnerable to collapse than catenary domes. Can you suggest a method of achieving a true dome with earthbags—e.g., how would the tamping even work? Tamping is way easier done with the bags horizontal. Would you have to pre-tamp, and set them in place like bricks? This would be inadequate for really mashing the bags into a monolithic form. Q: My idea is to lay earthbags over a geodesic dome. Is this feasible? A: Yes, this is possible; I have done it on small scale (about 16' diameter), but it should also work scaled up. This is about the only way to build anything approaching a hemispherical dome using earthbags. Another approach is to use ferrocement like was done with this. Q: In Sue's house with the Geodesic dome framing and your pole rafters, what did you use to prevent the bags from "falling in between" the wood frames? I think I saw cables or something that the bags could rest against, but I wanted to know if you could explain what you did there, please? I am considering a cluster of 4 wood framed geodesic domes about 16 ft in diameter each. They will be not be touching each other, but be in close proximity to each other. What did you use on your house and Sue's house to keep the bags on the outside of the circular shape of the dome or conical design of your house? Would you suggest plywood as an initial shell, then place the bags around and against that? A: As I recall there was nothing there but the wooden geodesic framework, which was sufficient to support the bags in that dome shape. It would certainly be possible to run strands of wire, or even wire mesh over the dome framework for additional support if this seems necessary. It is only toward the very top of the dome that the impulse to fall is noticed anyway. You could also support them with plywood; I would say it partly depends on what interior surface you want exposed. If you use plywood, then you wouldn't need to plaster the bags in the inside...or you could even attach plywood later on the inside of the wood framing, leaving a void for wiring lights, etc. Q: I am wondering if earthbag construction can be an oval instead of a circle. Would this too ambitious for a first-time project? What design or structural challenges would you encounter? A: The large living room kitchen of the earthbag home that I built was an ellipse, and this turned out to be one of the most difficult challenges of the entire project. Because of the uneven forces inherent in such a shape, I eventually had to create a rigid pole structure inside the dome to force it to stay in the shape I wanted...otherwise it would have been unstable. I generally advise people to stay with circular domes for this reason. However, if I did it, someone else could too...it just requires more careful engineering. Q: You built a wooden skeletal tipi type framework above the first floor level of your large central section. Would that be necessary with my 20' diameter cone? A: I had to build this framework because I was working with an ellipse. With your circular project, you might get by without the framework. Q: Is perlite even a possibility for domes? A: I have never worked with perlite. I would expect to be a little slippier, which wouldn't be good for domes. I have built domes with scoria and it worked out just fine.